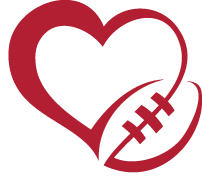 Join us at Painting with a Twist on July 14 and paint your fave team/player jersey while enjoying snacks and drinks. Door prizes and more surprises! Proceeds from this event will be donated to CharitaBulls! This is a community event so invite your family and friends. Seats are limited. We are excited to partner with the Wade Smith Foundation for Smitty's Day at the Park on July 8, 2017 at Levy Park. We are sponsoring and organizing the volunteers and need YOUR help to make the day a success. CLICK HERE to register to volunteer. To register you child for one of the 5 FREE camps CLICK HERE. Sponsor and Vendor Booth opportunities are available. 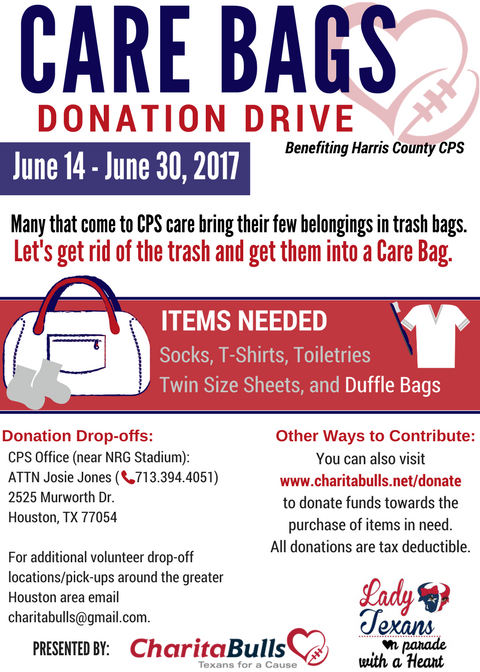 Email us at charitabulls@gmail.com for more information on how you can get involved. Harris County CPS reached out to us requesting assistance with donations. They need items for current and future children in their care. The majority of children that enter CPS carry their few belongings in a trash bag. We want to collect as many duffle bags as possible in the coming weeks. No child should have to carry their lives in a trash bag. To make a tax deductible donation towards the purchase of duffle bags click HERE. Sponsorship Packets are available. Email charitabulls@gmail.com for more information on becoming a sponsor. We already know who OUR pick for the Nationwide #WPMOY is but it's time to let the rest of the NFL know it! We are doing a #CushingWPMOYChallenge - Challenge ha! Here is the scoop: Between today and January 8, 2017 at 10 PM you can enter up to 5 times EACH DAY by posting using #CushingWPMOYChallenge. We have some cool prizes (thats right multiple) to give away. Rules are listed below! Visit our Facebook, Instagram and Twitter accounts to submit your entries! Join us on Social Media for the CharitaBulls 12 Days of Christmas Giveaways!